Last fall, we got L in to a one day a week toddler class that I take her to every Friday. Some days I go home and take a nap while she’s there. Some days, I go get breakfast and run some errands. This past Friday was an errand day. I needed to pick up some things from Lowes and Meijer, but first I needed breakfast. I noticed a few weeks ago that Breakfast at Tiffiny’s was opening a second location. J and I had tried once before to stop in for breakfast, but they were pretty full, so we passed. 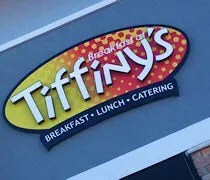 The new Breakfast at Tiffiny’s location is on Centre Street in Portage in the new plaza with Centre Street Taphouse and a Biggby. The space is deceivingly big. It looks like a small space from the outside, but it’s a long building which has room for a couple dozen tables. When I walked in, a waitress told me to find a seat wherever I would like. I went a table in the back near the kitchen. The middle of the restaurant has a long, two sided bench seat that several tables shares. The restaurant was not all that crowded, so I didn’t feel bad taking up a four top. As soon as I sat down, a waiter came over with a menu and offered a drink. I ordered a Pepsi while I was looking over the breakfast menu. Unfortunately, they didn’t have a Steak ‘n Eggs or a Eggs Benedict, so I had to look for something else. When the waiter came back, I put in my order for the Chicken and Waffles. 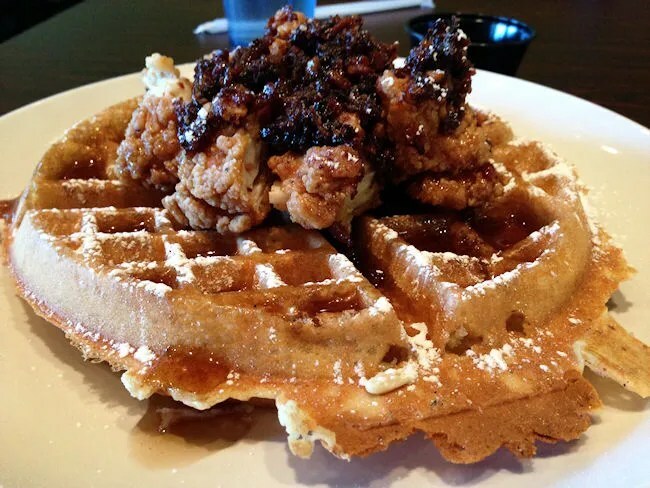 The fluffy, malted waffle is topped with chicken tenders covered in a maple jam as well as syrup and powdered sugar. I was a little hesitant about the jam at first, but it was actually pretty good. A sweet and salty combo on top of crispy, juicy chicken tenders. The waffle was very light and very fluffy. Whenever I make waffles at home, they’re always so dense. These were not those kind of waffles. The bill was a little over $11 and breakfast took a little less than a half hour. 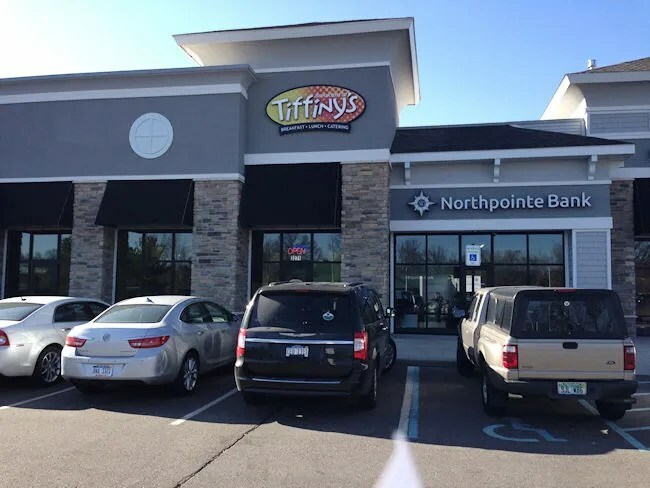 J and I liked our last trip to Breakfast at Tiffiny’s near WMU, but it’s always a little off putting bringing a toddler in to a breakfast plate filled with hungover college kids on a Sunday morning. This new location is a great breakfast spot and will really open them up to a whole new client base. Thanks for the nice review..we now have steak~n~ eggs so stop on by and check it out!